With a population of approximately 201,000, North Hudson is the collective name of the municipalities of Weehawken (2010 Census population of 12,554), Union City (66,455), West New York (49,708), Guttenberg (11,176) and North Bergen (60,773) in Hudson County, New Jersey. Though each municipality has an independent local government and school district, they collaborate (sometimes with Hoboken) on certain services including fire-fighting, water supply, sewage treatment, emergency medical services, and vocational education. Some are members of the Bergen County Cooperative Library System Most of North Hudson falls within New Jersey's 8th congressional district, with a small portion in the 9th. The towns are among the most densely populated in the United States. Situated on the Palisades on the Hudson Waterfront on west bank of the Hudson River, the area is directly across from Midtown Manhattan and Upper West Side in New York City, north of Hoboken and Jersey City (the county seat), and east of the New Jersey Meadowlands. Its high elevation allows North Hudson expansive views of the Manhattan skyline, the Meadowlands, and the Watchung Mountains. The cuesta, or slope, on the west side of area makes North Bergen the city with the second most hills per square mile in the United States after San Francisco. The geographically long narrow region is a contiguous urban area where it is often difficult to know when one has crossed a civic boundary, and there is little, if any, physical acknowledgment of the demarcations. In the absence of an urban master plan, early thoroughfares (such as the Hackensack Plank Road, Paterson Plank Road and Bulls Ferry Road) and early real-estate speculators (such as the Hoboken Land Improvement Company) created the current street system. First the merger of Union Hill and West Hoboken, and later the opening of the Lincoln Tunnel, influenced the five towns to agree to re-number the east-west blocks (and coordinate house numbers), from 2nd Street in the south to 91st Street in the north. There are very few large green open spaces, notably North Hudson Park and the collection of private cemeteries on the Western Slope, including Hoboken Cemetery and Flower Hill Cemetery. The dense urban grid is dotted with vest pocket parks and high school athletic fields. The Hudson River Waterfront Walkway is in various states of completion along the river's edge. North Hudson is home to the largest Cuban American population outside of Florida. With 201,000 residents, North Hudson has a population density that is among the highest in the United States. Of municipalities with over 50,000 people, Union City is the most densely populated in the United States. North Hudson also has one of the nation's largest proportions of foreign-born residents. Among the 100 US cities (population 5,000 and up) with the highest percent of foreign-born residents: West New York (65.2%), Union City (58.7%), and Guttenberg (48.7%). In the late 2000s, North Hudson came to be dubbed as "NoHu", a haven for local performing and fine artists, many of whom are immigrants from Latin America and other countries, in part due to lower housing costs compared to those in nearby art havens such as Hoboken, Jersey City, and Manhattan. The earliest known residents were the Lenni Lenape Native Americans, specifically the Hackensack and Tappan, whose territories overlapped. In 1658 Dutch Director-General Peter Stuyvesant of New Amsterdam negotiated a deal with them for the area named Bergen, "by the great rock above Wiehacken," including all of what would become North Hudson. Curiously, North Hudson lies north of Bergen, the first permanent settlement in New Jersey, founded in 1660. During the British and colonial it was known as Bergen Woods and was in the southeastern part of Bergen County until the establishment of Hudson County on February 22, 1840. In 1843 most of the area became part of North Bergen Township when the county was divided into Bergen Township and North Bergen. Like most of the region surrounding the Upper New York Bay, the area experienced waves of immigration, specifically: settlers from the Netherlands, British colonialists, German-speaking farmers and entrepreneurs, Irish fleeing the famine, "Ellis Islanders", World Wars refugees, the "Spanish" (initially Cuban immigrants, and later other South and Central Americans), and most recently, so-called "cosmopolitans" including individuals and childless families yuppies, retirees, gay men and women, newlyweds, house-sharers, and rent refugees from less gentrified areas. In the mid-19th century and early 20th century German Americans and Dutch dominated the area. They, along with Swiss and Austrian immigrants, founded the European-style lace making industries, for which they were famous, and North Hudson became the "embroidery capitol of the United States". Many of the factory buildings still house clothing manufacturers, while others have been converted to art studios or housing. It was this community who (in 1915) established what has become longest running passion play in the U.S., creating America's Oberammergau. The German-American Volksfest has taken place annually since 1874 at Schuetzen Park. It was during the same period that the narrow waterfront at the base of the Palisades became (along with Hoboken, Jersey City, Bayonne, and Edgewater) an integral part of New York Harbor's shipping industry. Rail lines under and on both sides of the Palisades were laid. From its terminal in Weehawken the West Shore Railroad operated long-distance and commuter passenger train and ferry service (used by travellers and locals alike), from 1884-1959. North Hudson County Railway developed an extensive network of horse-drawn railroads and later, streetcars, taken over by Public Service Coordinated Transport which bustituted the system in the 1930s and 1940s. In the early 1900s the idea of the all towns consolidating emerged and subsided, but eventually resulted in the consolidation of West Hoboken and Union Hill in 1925. In the 1960s and 1970s some residents headed to the suburbs (often close-by Bergen and Passaic County). Simultaneously middle-class and professional Cubans, fleeing the revolution in their home country, re-located to the area and are generally considered to have "saved" it from a devastating downward spiral, leading to the nickname "Havana on the Hudson". North Hudson has the second largest Cuban American population in the United States behind Miami. 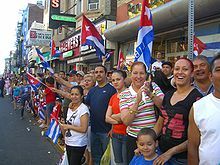 Since its inception in 2000 the Cuban Day Parade of New Jersey has become a major annual event in North Hudson, beginning in North Bergen and travelling south to its end in Union City. Unlike other urban industrial areas of comparable size, age and density, North Hudson did not experience marked urban decay or a crime wave during the late 20th century, its population and economic base remaining basically stable, in part, because of its good housing stock, tightly-knit neighborhoods and satisfactory schools systems. NY Waterway re-instituted ferry service in the late 1980s, and in 2006 opened a state-of-art terminal on the Waterfront for boats traversing the Hudson to lower and mid Manhattan. The Hudson-Bergen Light Rail, connecting to south Hudson, has stations at Tonnelle Avenue in North Bergen, Bergenline Avenue and 48th Street at the Union City/West New York border, and Port Imperial and Lincoln Harbor on the Weehawken waterfront. New Jersey Transit, since its opening, has promoted Bergenline Station as a hub/transfer between the light rail and buses: 22, 84, 86, 89, 156, 159, 181 and (one block west on JFK Boulevard) 88, 154. Nungessers at the Bergen County line is a major origination and transfer point. Transfer Station, Hudson County is also a transit hub. Manhattan and suburban-bound bus service is provided along Boulevard East, Bergenline, Kennedy Blvd., and 32nd Street. Additionally there are many privately operated licensed mini-buses locally known as immi-vans, gua-guas, carritos,or dollar buses along Bergenline to Journal Square, Downtown Jersey City, 42nd Street in Manhattan, and south east Bergen County, and Paterson. ^ "BCCLS". www.bccls.org. Retrieved 22 April 2018. ^ "Union City street names". capital.net. Retrieved 22 April 2018. ^ Romano, Jay (November 28, 1993). "A Sense Of Place". The New York Times. ^ "Empty 'Echo' Vintage shop and art hub on Park Avenue to close next month - It was just last winter that ArtsEcho Galleria was featured in Palisade Magazine as a thriving nucleus of fashion art and the creative spirit that was bucking the "going ou..." hudsonreporter.com. Retrieved 22 April 2018. ^ "UC History". ucnj.com. Retrieved 22 April 2018. ^ Cunningham, John (2004). This is New Jersey (4 ed.). Yonkers, New York: Rutgers University Press/Hudson River Museum. p. 100. ISBN 0-8135-2141-6. ^ "COMMERCIAL GROWTH IN NEW JERSEY TOWN ON HEIGHTS HAS DOUBLED THE POPULATION WITHIN FIVE YEARS; West New York the Greatest Embroidery Factory Town in the Country and a Growing Silk Centre ;- Big School Just Finished and Artistic Municipal Building Nearing Completion ;- Hundreds of Apartment Structures Erected in Last Three Years". The New York Times. December 20, 1914. ^ "Hudson County Is Awake; Vast Improvements Are Under Way And In Prospect. Evidences Of A Realization That She Has Not Kept Up With The Procession -- Parks, A Fine Driveway, And Rapid Transit" (PDF). The New York Times. March 29, 1891. ^ "BEAR OF ECLIPSE STIRS WEEHAWKEN; Residents Oppose Plan to Consolidate Neighboring Towns Into Hudson City. SATISFIED TO STAND ALONE As for Its Rivals, Look at Their Debts -- And Then Think of Guttenberg's Reputation!" (PDF). The New York Times. November 13, 1909. ^ "NEW JERSEY TOWNS MAY CONSOLIDATE; Weehawken, West Hoboken, and Union Hill Discussing a Municipal Merger" (PDF). The New York Times. June 18, 1911. ^ "HOBOKEN TAKES STEPS TO MAKE A 150,000 CITY; Bill to Consolidate Outlying Suburbs to be Sent to Trenton. MUCH SPECULATIVE BUYING Recent Purchases, Supposed to be for Railroads, Now Attributed to Prospective Home Development" (PDF). The New York Times. November 12, 1905. ^ "West New York Public Library". www.wnypl.org. Retrieved 22 April 2018. ^ and, Evelyn Nieves. "Union City and Miami: A Sisterhood Born of Cuban Roots". nytimes.com. Retrieved 22 April 2018. ^ Rosero, Jessica (June 11, 2004). "Celebrating Cuba Pride: Fifth annual Cuban Day Parade draws residents and honored guest". Hudson Reporter. Retrieved 2010-06-15. ^ Miller, Jonathon (May 31, 2007). "Judge Decides Against a Mayor Who Banned Cuban Parade". New York Times. Retrieved 2010-06-15. ^ Schmidt, Margaret (May 30, 2009). "Cuban Parade of New Jersey". Jersey Journal. Retrieved 2010-06-15. ^ Rosero, Jessica (June 17, 2007). "The parade marches on: Eighth annual Cuban Day Parade of New Jersey keeps traditional route". Hudson Reporter. Retrieved 2010-06-17. This page was last edited on 27 December 2018, at 03:17 (UTC).